Today is the last day of 2011. I'm not sad to see this year end. In fact, I'm thrilled. This has been a tough year. Our basement flooded more times than I can count. Okay, not quite. Just 4 times. But still. Once would have been sufficient. And then to end the year with a fizzle, Curly found out his employers would no longer support his working at the dinner theater. Losing income is never pretty. On the other hand, we have had some good times, too. I found out a year ago that I would be part of Amanda's team. I think we can all agree that that's been fun. Especially the party. And I actually managed to finish a quilt (or two) this year. 11 quilts!! That blows my mind a bit. And that's not counting all the table runners, bags, and craft show items I made as well. I've been busier and more productive than I thought! My goal for 2012? Pretty simple -- 12 in 2012. I think this is pretty doable, since I have several quilts-in-progress right now. If I just finish those, I'm more than halfway there! Also for 2012 -- The Weekender Bag. I will not be afraid! May the next few days be full of wonder and peace. A few weeks ago, we rode the rails on the Santa Train. Ginger was so excited. When Santa arrived, however, Ginger was no longer excited but completely terrified. She wouldn't look up until Santa went in another car. And Patch was pretty nervous, too. He had to sit on my lap and wouldn't talk directly to Mr. Claus. Mini-me, on the other hand, chattered away about her desire for presents previously unmentioned. Every year, Curly's work does a breakfast with Santa. The past couple of years, he has gotten to put on the suit. Again, Ginger would not go anywhere near him. When I took this picture, she had wrapped herself around my legs and would not let go until Santa left the area. Let's hope he overlooks her rudeness and brings her some presents. After all, of the four kids, she's been the nicest. Today I'm a Course Instructor over on the Riley Blake Cutting Corners blog. Go here to check it out! Not to toot my own horn too loudly, but it's a great tutorial for those irresistible 5" and 10" stackers and a little yardage. Let me know what you think! Her show choir had a Christmas performance at the mall over the weekend. Apparently she's very focused. I took a couple of other pictures, and they all have this face! Funny focused Flower aside, her show choir is very talented. They sang a White Christmas medley that had my toes tapping, and they even dance a little. She loves being a part of it. Ginger turned two this past Friday. She loved her birthday. She had donuts for breakfast, chicken nuggets and ice cream for lunch, and a cupcake for dinner. She only got a few presents (because she's only two, people). Flower was so sweet and gave Ginger a couple of her previously loved toys. Grandpatty gave her an Elmo, and the rest of us gave her Minnie's Bowtique. She has lots of eager helpers for play time. Where the heck did 2 years go? It's just nuts! Folks, may I have your attention for a moment? One week from today, all the stress will be over. All the preparation will be done. But getting to that point? Holy moley, it's going to be nuts! I have a lot to still finish. Am I alone in this? I doubt it. So instead of doing a post on all the things I have yet to do, I thought I would post about the things I finished last week. First up is this adorable baby quilt, made from Ruby. It's also a Thimble Blossoms pattern called Wild Thing. It was my last customer order of the season. For the back I used some Nicey Jane. I love this stuff. 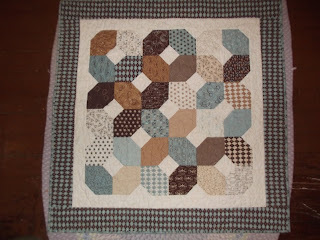 Then, my friend Lauren and I decided to make a quilt for our blogless friend. It was made from leftover blocks from a quilt found here. We delivered it this week, so she would have a chance to enjoy it. I think she liked it. Proving yet again that handmade is well worth the stress. This is what I would have worked on last night, had I had batting that was the right size. But since I didn't, I worked on it today. The binding is on, so tonight I will finish it while watching White Christmas. I even have a cannoli for the occasion. So, when is bedtime? It's officially Christmas. How did that happen? We have been busy lighting the lights, trimming the tree, and decking the halls. So far, the season is full of joy. What it isn't full of is sewing. I've been busy with a few projects, but I am having a hard time finding my motivation. I think also that I have so many things to work on, that it's hard to focus. Am I alone here? Perhaps not. I signed up for the Friday Night Sew In for tonight. I was hoping to get a baby quilt finished, but my batting is the wrong size. Ugh! I'll remedy that tomorrow and get it done and mailed out to my customer. I have a few more things I'm working on. I'll take pictures tomorrow when it's light. So what are you working on? Are you ready for Christmas? I went shopping at Target last night, and practically skipped out thinking I had just finished. Then, I remembered I had nothing for Flower. Literally nothing. And then I started to feel stressed. She's with her mom this year, so I can shop for her after Christmas without too much of a problem. I would love some book recommendations for a tween, if you have any. She loves the Fablehaven series and would like books with a similar feel. She is not interested in Harry Potter, and she is way too young for Twilight. Any help?